It's that time of year again when we ask the question: Will we have a Scottish-trained winner of the William Hill Ayr Gold Cup? 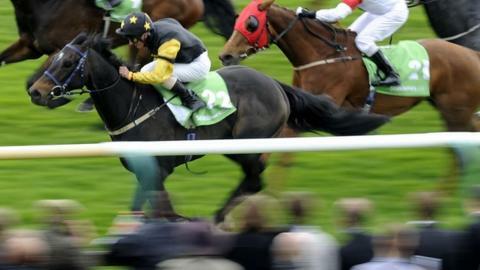 The big race - Europe's richest sprint handicap - worth £120,000 and over six furlongs - is off at 15:30 BST on Saturday. You have to turn the clock back and reach for the history books to find the last time a horse trained in Scotland won the race - Roman Warrior back in 1975. If my arithmetic is correct, that is all of 37 years ago since Nigel Angus - who trained just across the road from the racecourse - produced the mighty Warrior to win on a desperately wet day on heavy ground. Since then, we have had a few candidates to emulate the Warrior but all have trailed in down the field. But now, the imaginatively-named Hawkeyethenoo is fancied by punters and bookmakers to end the long wait. Trained by Jim Goldie in Renfrewshire, Hawkeyethenoo has already won the Stewards' Cup at Goodwood this season and is around 12-1 with the bookmakers. It has been a lifelong ambition of Goldie's to win the Ayr Gold Cup. "You need everything in your favour to win a race like this and the ground will be the key to whether we win it or not," says Goldie. "It's been a very wet year and it would be nice to get some good ground but I doubt we are going to get it. "Jockey Graham Lee gets on very well with the horse and obviously the Stewards' Cup was the career high on the flat for him and a career high for myself. "He's a very talented horse." Ian Semple is another Scottish trainer with a live contender in the shape of Cheviot who recently won a good race at Haydock. Of course, there are 25 other runners who will all fancy their chances of lifting one of the most prestigious prizes in the racing calendar. Doc Hay won the Portland Handicap at Doncaster just last weekend and, over in Ireland, there was a win at Group 3 level for Maarek at the Curragh. Both will be strongly fancied along with previous winners Our Jonathan and Regal Parade. The Scottish racing fraternity will be hoping that in 12 months' time it is not 38 years since the last Scottish-trained winner of the Ayr Gold Cup. Follow Geoff Webster on Twitter.